Visitors to Wicked BIG Bugs will encounter an array of fascinating giant animatronic insects all nestled within the trees, bushes and undergrowth for a truly realistic, albeit larger-than-life, experience. Roles will be reversed as you venture through the exhibit and find yourself looking up into the eyes of an 8-foot-tall tarantula, marveling at the tail of the mighty emperor scorpion looming 15 feet in the air, admiring the 8-foot wingspan of the Madagascan sunset moth, and more gargantuan moments. Adventure-seeking children will be able to not only learn about the orb-web spider, but test their own web-climbing skills on a large rope spider web. There will also be an interactive education station, and opportunities to meet some real-life insect ambassadors up close during scheduled encounters. What real insects may lack in size, they make up for with their own kind of super powers. Take the athletic ant, which can carry up to 10-50 times its own bodyweight; or the busy bee, which is responsible for pollinating 80% of the world’s plants – we can thank these buzzing beauties for one out of every three bites of food that we eat! Despite their importance, insect populations are under threat and need our help. Guests of all ages will learn about these pint-size “super heroes,” and how to ensure that we “don’t bug the bugs” by taking simple steps in our everyday lives to contribute to insect conservation – including buying native plants for your garden and avoiding the use of pesticides. More information about both of these programs can be found at www.zoonewengland.org/wickedbigbugs. 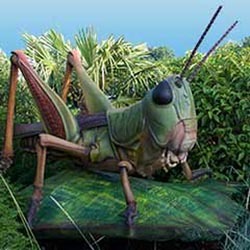 This summer guests can visit Franklin Park Zoo for a larger-than-life adventure at Wicked BIG Bugs! From May 25 to September 1, giant bugs are invading the Franklin Park Zoo in an exhibit featuring animatronic life-like bugs. With more than a dozen moving, buzzing bugs, including an 8-foot-tall tarantula, emperor scorpion and ants, this adventure-seeking experience for the entire family is not to be missed.